Hapag-Lloyd Cruises is part of one of the oldest shipping companies in the world. You can spot orange Hapag-Lloyd containers stacked on wharfs, racing by on double-stack trains and being towed by semis on highways around the world. And, as a longtime division of Hapag-Lloyd AG, its cruise arm shares the same roots and history. Hapag-Lloyd Cruises is a 100 percent-owned subsidiary of TUI AG, Europe's leading travel group. It's the result of a 1970 merger between two of Germany's oldest steamship companies, Hapag (Hamburg-Amerikanische Packfahrt-Actien-Gesellschaft or Hamburg America Line) and Norddeutscher Lloyd (NDL -- North German Lloyd). Both companies were founded in the 1840s to carry passengers and freight between what is now Germany and the United States. Hapag was founded in Hamburg, while North German Lloyd served Bremen. At the time of the companies' founding, the ports were city-states and longtime rivals. Both lines prospered and by the 1890s were building large, fast, luxurious ocean liners. Hapag claims to have commissioned the first purpose-built cruise ship, Augusta Victoria, in 1891. In 1896, Hapag's Furst Bismarck crossed to New York in six days, 11 hours and 44 minutes, making it the fastest ship in the world. In 1899, NDL commissioned the first four-funnel liner, Kaiser Wilhelm der Grosse. In 1911, Hapag launched the first of three giant sisters, the largest ships in the world: Imperator, Vaterland and Bismarck. At the start of World War I, Hapag was the world's largest shipping company with 175 ships. Those ships that survived the war, including the three giant sister ships, were forfeited to the allies as reparations. (NDL was permitted to retain a few ships.) The three giants became famous for their new owners. Imperator had an illustrious career as the Cunard flagship Berengaria. Vaterland was rechristened Leviathan and served as flagship of the United States Lines. Bismarck sailed for White Star Line as Majestic. Both German companies built new ships in the 1920s. Notable among them were Hapag's Columbus and NDL's Bremen and Europa, the fastest ships of their day. In 1934, the German government became majority stockholder in both lines. Those ships not lost in action during World War II were seized as reparations. Europa, for example, sailed for many years as the French Line's Liberte. After the war, Hapag concentrated on freight traffic, while NDL returned to the passenger trade. Hapag was the first line to transport standard containers, and Hapag and NDL pooled resources to build the world's first dedicated container ships, which sailed under the name Hapag-Lloyd Container Line. After the merger, Hapag-Lloyd AG discontinued its transatlantic passenger service. However, in 1981 the line returned to cruising with the launch of Europa, a ship that set the standard for luxury and service in the German market. Seventeen years later and under the brand name of its new subsidiary Hapag-Lloyd Cruises Ltd., it introduced its new flagship, the fifth to be called Europa. Today, Hapag-Lloyd Cruises operates five ships, ranging from ultra-luxe to expedition. Hapag-Lloyd's five cruise ships offer onboard and in-port experiences that range from luxury to upmarket soft adventure. Traditionally, Hapag-Lloyd has catered to German-speaking passengers from Germany, Austria and Switzerland, though the line is beginning to court English-speaking travelers from the U.S., U.K. and Australia and is tweaking some onboard offerings accordingly. All five vessels are top-of-the-line (and, budget-wise, fares are on the high side), but each has a different personality and specialty. The 28,890-ton, 408-passenger Europa, the best known, offers a formal luxury cruise experience as it essentially travels around the world each year. (Few if any itineraries are repeated.) Both 8,378-ton, 184-passenger Hanseatic and 6,752-ton, 164-passenger Bremen are expedition vessels with E4 ice ratings, the highest given to passenger ships. They travel to the Arctic and Antarctic, as well as other exotic regions. Hanseatic is classed as a five-star ship to Bremen's four, and the former has slightly upgraded cuisine and enrichment in addition to larger staterooms. 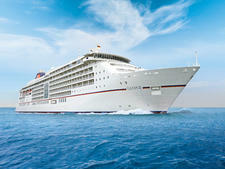 The 30,277-ton, 698-passenger, Columbus 2 is on lease to Hapag-Lloyd until May 2014, when it returns to Oceania's fleet as Insignia. The ship caters to a less formal traveler than does Europa, with a small kids center, expansive spa and the same approach to creating unique itineraries. The real excitement for Hapag-Lloyd is the launch of its first new-build since 1999. Europa 2, unveiled in May 2013, is a 40,000-ton, 516-passenger vessel aimed every bit as much at the ultra-luxe market as Europa, but its target audience is a younger, more active traveler. Families, in particular, are catered to with dedicated kids facilities that appeal to all youngsters, from toddlers to teens. Regardless of the ship, Hapag-Lloyd Cruises attracts a well-heeled, predominantly German-speaking clientele. Regular passengers -- most passengers are repeaters -- travel all the ships of the line, choosing their sailing by itinerary, but each ship has its own niche. Columbus 2 attracts more families. Hanseatic appeals to active adults who want pampering on expeditions, while Bremen, which also is oriented to adventure-minded travelers, features a quality experience at a more moderate price point. Europa, its most traditional ship, tends to draw travelers who want a more classic luxury experience. And Europa 2, drawing on top-notch features found on Europa, is the cruise line's jazziest, most contemporary ship, featuring dynamic art collections and sophisticated enrichment and entertainment that range from a kitchen studio for cooking-related courses to a jazz club. Its appeal is primarily to younger, less traditional luxury-minded travelers, including families. Hapag-Lloyd has also dedicated Europa 2 as its "bilingual" ship, reaching a more international passenger base with enhanced materials and activities particularly geared to English-speaking passengers. 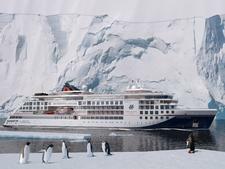 The present Hapag-Lloyd Cruises motor fleet comprises five ships: the luxurious flagship Europa; expedition ships Hanseatic and Bremen; Columbus 2, which offers a more informal take on the Europa experience; and Europa 2, the line's first new-build in 14 years. Luxurious Europa is a 28,890-ton ship that carries just more than 400 passengers in all-suite accommodations. It offers unparalleled pampering by its crew of 280. Launched in 1999, Europa underwent refurbishments in 2004, 2007 and 2009 that have enhanced its children's playroom, provided cosmetic upgrades to cabins (and resulted in the creation of new spa-oriented staterooms), redesigned the spa and fitness facility, and added the fantastic Sansibar indoor-outdoor lounge. 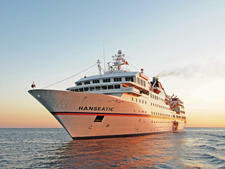 Hanseatic, commissioned in 1993, measures 8,378 tons and carries 184 passengers. It combines the luxury of a top-rated cruise ship with the adventure of an expedition vessel by offering spacious cabins, fine dining, a high level of service, onboard lectures by renowned experts and Zodiac excursions. Bremen, built in 1990, measures 6,752 tons and carries 164 passengers. It is the first expedition ship to offer some cabins with private balconies. Columbus 2 is Hapag-Lloyd's largest ship, measuring 30,200 tons and carrying 698 passengers. While similar in some ways to Europa -- especially when it comes to cruising all over the world -- Columbus 2 offers more options and choice in all aspects, from bars and restaurants to spa and family-oriented facilities. This ship, formerly known as Oceania's Insignia, is on charter to Hapag-Lloyd and will return to Oceania in May 2014. The all-new Europa 2, which debuted in May 2013, is the most contemporary, sleek, ultra-luxe and ultra-casual vessel in the fleet. The 40,000-ton, 516-passsenger vessel features gourmet dining, focusing on the cuisines of Continental Europe, Italy, Asia and France in its main restaurant and three smaller boutique venues. The all-suite ship features spacious staterooms with separate living and sleeping areas, state-of-the-art tech toys, walk-in closets, spacious balconies and marble bathrooms with separate tubs and showers. It's got the fleet's largest spa and a series of kid-friendly facilities that accommodate everyone from toddlers to teens. Six months of the year Europa follows the sun on a world cruise that takes it to the Americas, the South Pacific, Asia and the Middle East. 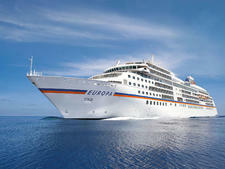 The rest of the year, Europa sails out of Germany to Scandinavia and the Baltic and on fly-cruises in the Mediterranean. The world cruise is divided into segments, and almost no one sails the entire circumnavigation, choosing instead two- to three-week segments. In Europe there are short three-night cruises up to longer 18-night cruises. Most fall in the 10- to 14-night range. Columbus 2 also follows the sun for six months. Other seasons find it in the same parts of the world as Europa. Cruises average in length from 10 to 18 nights. Hanseatic travels the world for much of the year. It is an expedition vessel capable of exploring remote coasts worldwide. 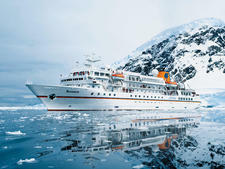 Hanseatic has the highest ice class rating for a passenger ship (E4) and sails to the Arctic regions of northern Europe, Asia and North America in summer, including a Northwest Passage expedition from Greenland to Alaska and an exploration of Russia's Kamchatka Peninsula. It cruises the Antarctic continent in (Northern Hemisphere) winter and the smallest islands of the South Pacific and Indian Ocean. Its shallow draft also allows it to cruise the Amazon River. Cruises range from 10 to 18 nights and longer. Bremen, which also has an E4 ice rating, travels Arctic and Antarctic routes similar to Hanseatic. It also cruises the South Pacific, Indian Ocean and Amazon. Cruises range from 10 to 22 nights and longer.